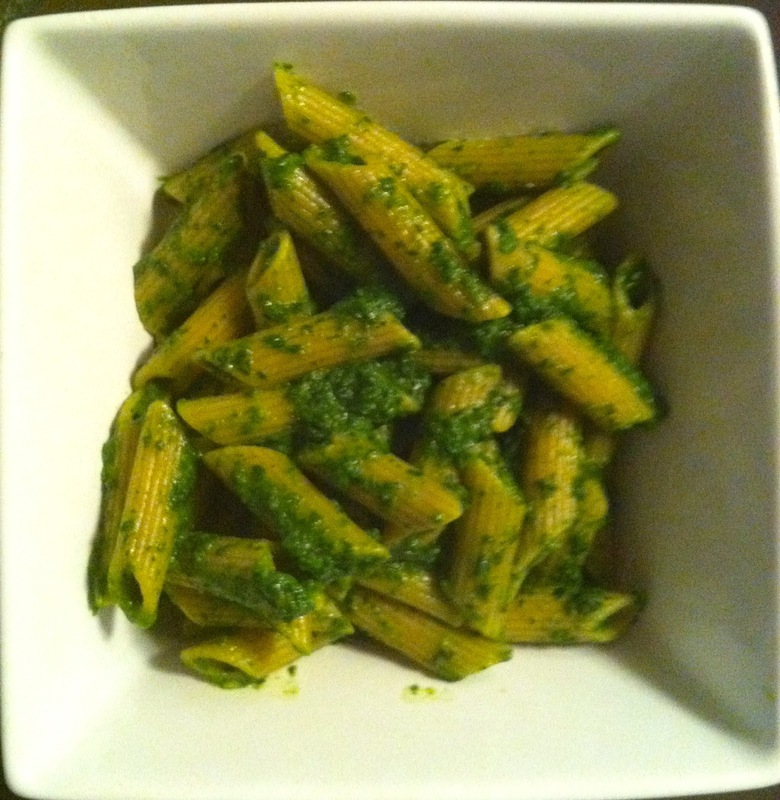 I'm sharing a quick, tasty, nutritious recipe with you today: whole wheat penne pasta with a ready-in-5-minutes spinach pesto. This is the type of meal I throw together when I'm having dinner alone or need a fast but filling lunch -- in other words, I probably wouldn't prepare it for Ryan, unless it was alongside a piece of chicken or steak. Or maybe if I tossed some shrimp in there as well. He'd eat it, don't get me wrong... it's just what I consider a "me meal." Simple, healthy, light. I absolutely love pasta...I pretty much wish I could eat it every day. 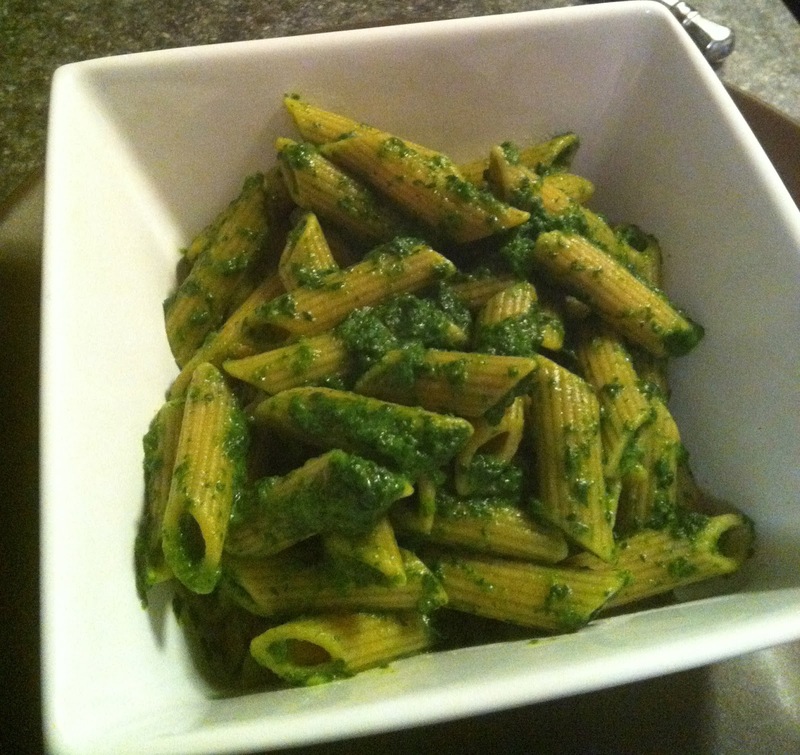 Pasta with pesto sauce is one of my faves, but it can be totally loaded with calories and fat. This version of pesto is light -- much less oil, no nuts, only a little cheese -- it isn't quite the same as the full-fat version, but it hits the spot and is virtually guilt-free. The primary ingredients are spinach, olive oil, and egg (which I added for a bit more protein but can certainly be left out if you're grossed out by the thought of a raw egg -- although I tell myself that mixing it with the steaming pasta kinda cooks it...... I'm still alive), and it's served over whole wheat penne pasta. Just a bit of parmesan to round it out. No nuts in this version, but the addition of pine nuts or almonds would definitely be delicious. 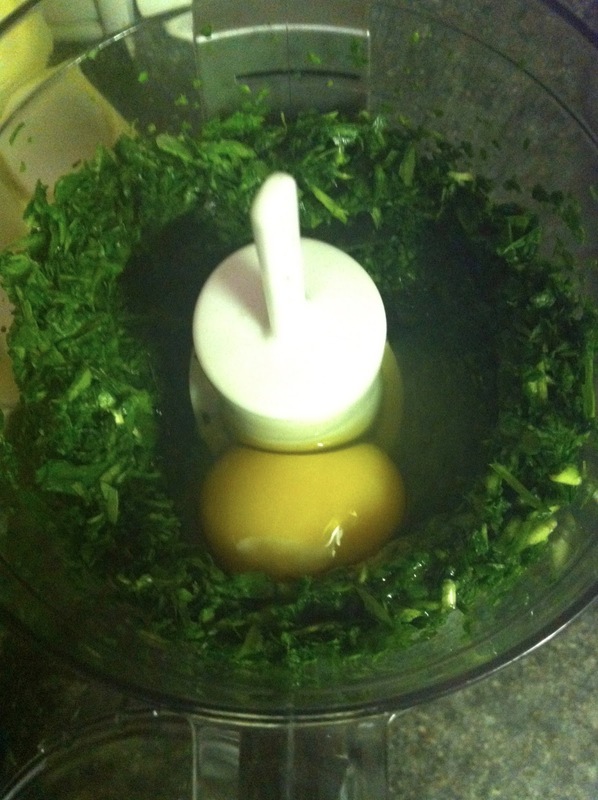 For the pesto, put 3 to 4 cups of baby spinach in your food processor and pulse until it's chopped fine. Then, add in an egg and pulse until combined. Slowly pour in about 2 tablespoons of olive oil. Pour into a bowl and mix with about 1/4 cup (more or less to your taste) of parmesan cheese, a bit of crushed red pepper for some heat, garlic powder for flavor, and salt and pepper to taste. Serve over prepared whole grain penne pasta. 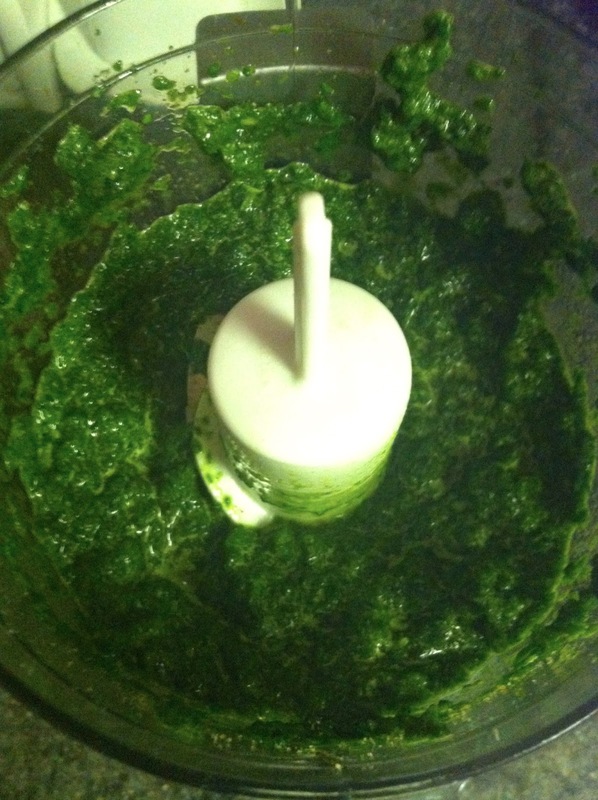 -Meanwhile, prepare pesto: In a food processor, grind 3-4 cups of spinach until fine. Add in 1 egg and pulse until combined. Slowly pour in 2 tablespoons of olive oil. Pour pesto into bowl. Mix with parmesan, crushed red pepper, garlic powder, and salt and pepper. Serve over hot pasta. Top with additional parmesan if desired. I love a great pesto! This looks so satisfying. Thank you, thank you! I have two boys with nut and egg allergies but I love pesto. Going to make this soon! Without the egg, of course. Actually, the egg should cook on the hot pasta. Pasta Carbonara recipes rely on that! :) Don't be scared. Just made this tonight, so good! It has a bit of a kick to it also. Thank you so much for this recipe!